As many of you might know that I have started Data Interpretation Preparation Series for upcoming exams. In this series, today I am providing Radar Graph questions set. Use the given data to answer the following questions. 1. What is the difference between the average sales of grade 1 and 2 in all 4 companies? 2. What is the difference between the total income of companies C and A? 3. In how many companies is the production of grade 2 tea at least 50% more than that of grade 1? 4. What percentage of the net income of company A is constituted by grade 1 tea? 5. 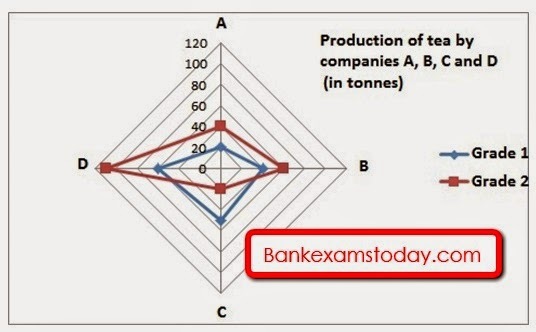 Total production by company D is what percentage of that of company B? Difference= Rs.1050000= Rs. 1.05 million. 3. 3 companies= A, B and D. See the table below.